A Literary festival in Carlisle (England)? At a meeting convened by Edna Croft a few weeks ago a discussion took place on the merits and feasibility of a ‘literary festival’ for Carlisle. Subsequently a number of those present began to pursue the means of staging such an event. I had been present at that first meeting, and came away with a head full of ideas, augmented by suggestions sent to me by writers from Litcaff (Carlisle’s own monthly writers get together). The first problem to overcome was that of exactly what was meant by a ‘literary festival.’ I hope it is not unfair to suggest that for most people the common assumption would be that it was an event at which celebrity authors promote their publications. Such a model would fit most of the literary festivals I have visited, where the word ‘books’, meaning mainstream-published books, is incorporated into the title. I would like to take up a little of your time in consideration of another type of festival, one in which the emphasis is on engagement with and participation in the act of writing. In fact, I would call this a writers’ festival if I had to give it a name. If I were starting up such a festival, I might aim to fill a day, and two or three venues. I would call upon the involvement of several – half of a dozen or more – local writing groups, and I would ask each of them to stage a themed workshop event – poetry, fiction, drama for example – and to send members to each of the other groups/ workshops. The workshops would be spaced throughout the day, in the same, or, if available, in different venues. The work created would form the basis of a reading that evening – in which perhaps, for a time, the workshop groups would eclipse the writing groups, allowing colleagues to see each other in a new light! A festival publication might also be drawn from this work. Elsewhere, during the day, I would run a day-long workshop/performance event on recording your writing, in audio, and audio-visual formats. Some pre-planned slots would be set, but an ‘off-the-street’ element would allow spur of the moment recordings too. This material too, could be used later, by participants, or on a festival webpage (Face-book/Vimeo etc). There is a lot to learn from seeing and hearing your own readings, and the event would also provide an on-going performance/audience opportunity for those who were interested, but not actually writing. A third element would be a festival bookstore, promoting small-press, local and self-publications. Famous writers would, of course, not be excluded, but they would have to creep in unannounced: the playing field would not only be level, the game would start with a nil-nil score! The other fundamental is that the groups to which the whole event is ‘farmed out’ will carry the burden of staging their own part of it. This is a festival for those who wish to share their involvement in a chosen cultural activity, and for their friends, and the curious passer-by. It is not a commercial, promotional model. It is a cultural, participatory one. If such a model worked, by bringing together and ‘entertaining’ the members of half a dozen local writers’ groups, there would be no reason why the net could not be cast wider in subsequent years, drawing in more groups, providing a wider range of activities over more venues, and extending the duration. 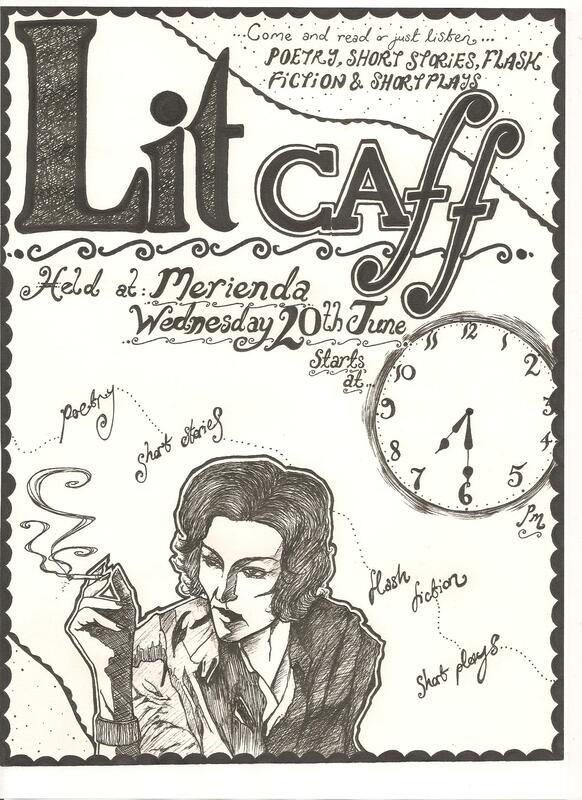 Darren Harper and I have discussed this and would be happy to use the LitCaff event (and its supporters) as a cornerstone of such a venture, and to support it wholeheartedly. We think it might be carried out in co-operation with a more traditional festival model, or as a stand-alone venture. We think an August 2014 date would be manageable if support were to be pledged reasonable quickly. If you think these ideas are worth considering, refining, or refuting, please do respond via the blog, or by e-mail direct, and do please pass this posting on, by re-blogging, networking, quoting from etc, to any groups or individuals that might be interested. Edna Croft has kicked the wasp’s nest… it’s up to us to provide the stings! Mike Smith. I like this very much. How would you manage the workshop material to prevent a bottleneck glut for the evening readings? And what do you mean by ‘themed’ workshops? Could you also run classes (like your video session) on DIY DTP or social media? How about guerrilla readings? Or a story soapbox? Exciting stuff. When you know how many workshops you can fix a time slot…wkshp members could decide how to fill it! ‘Themed’ to ensure variety was my thought. Thanks for the ideas! Talk to Nick about the annual Day of the Book in Felletin. It doesn’t include practical workshops, but it does foreground and celebrate small press and local writers. I’m garnering suggestions on my linked thread on Facebook and I’ll share them when the steam runs out. I’m also going to share the idea with my writing group though it doesn’t meet till 1st Oct.
I’m not in a writing group – but I think I’ll have to join one quick just so I can take part in this festival! The ideas sound great – and much more exciting than the traditional type of festival. Free spirits, I’m sure, would be equally welcomed! I’d be very interested in taking part in this! I very much approve of the idea of an inclusive writing festival rather than a doubling up of Words by the Water. And it should most definitely celebrate the best of Cumbrian writing (or Borders?). Hi Mike, Just read your post and wanted to make some comments straight away. I love your ideas for a �writerly� festival, particularly the inter-active format. I know I would love to be involved. The concept of merging and making seems to me very relevant � here is a chance for �little� people to shine. I can see the popularity of a �story-telling� room being open all day so anyone can drop by and listen, even if they don�t want to be involved in any other way. Just great to think you might bring writing out of the closet and into the town centre! 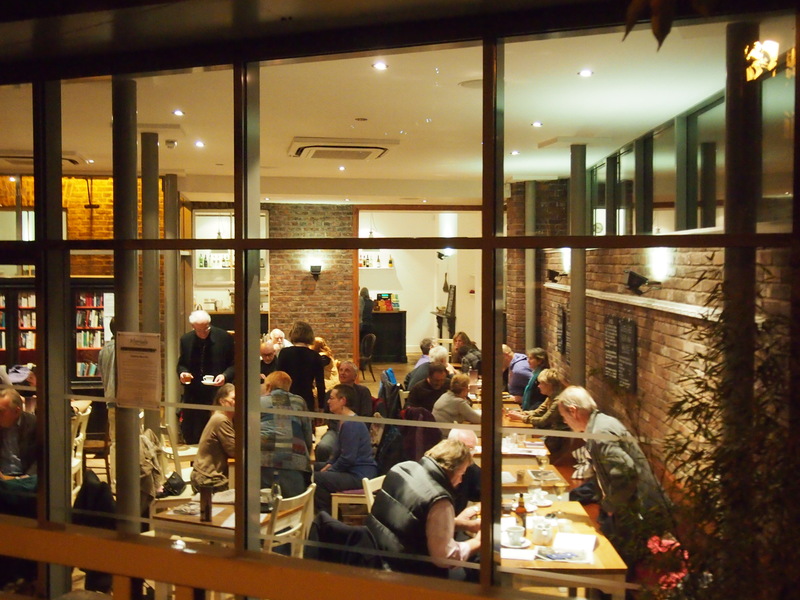 Down here in Penrith there was talk of Brunswick Yard having a Book Fair next year – Bookends Carlisle, Keswick, Withnail Books and our good selves were all interested – could this be something to tie in with your event? Sounds great, but I think it should be called a new-writing festival. Just a thought also (this may not be a popular thought and it may just address a hang-up of my own) I’m not sure if it should focus exclusively on bigging-up ‘local’ writing because I’m never sure what this term means! I know writers in Cumbria from elsewhere (myself included) – and also born and bred Cumbrians – who don’t always want to produce Cumbria-specific work and who feel a bit restricted by the ‘local’ tag. Perhaps there could be a Cumbrian/Borders thread running through the festival to give it an identity, while at the same time being welcoming to writers of non-Cumbrian/Borders work (whatever all these terms mean anyway)?! As for the involvement of ‘famous’ authors, I say bring them on! High-profile authors can mingle with non-published and aspiring, and I think this is healthy for both groups. So if well-known authors want to hitch a ride, (the Brunswick Yard Book Fair idea seems to me a perfect potential tie-in) I think we should encourage and celebrate this. We’re all writers, after all. This fact is hierarchy-busting in itself. Whatever decisions are made, I wish the whole thing well and offer my time if and when help is needed. Thanks Karen, I myself am a Midlander, living and writing in Cumbria. I could ask Terry (Deary) if that would help. He’s over with us in May next year in any event. He lives over in Durham so it’s not a big journey if he has the time etc. I attended, and spoke at, the meeting which Mike describes in this blog post, and I find his ideas really interesting. In my view, and I feel this very strongly, there is room for both “models” of festival running side by side: a festival which features well known, best-selling writers, running alongside more “organic” activity, as outlined above, which features local writers and a wide range of participative and “show-casing” writing activity. I also believe that we should be socially and culturally inclusive in our approach – this “two strand” style of festival would permit this. Firstly, it would have appeal, and cultural benefit for those people who like to see the well-known, commercial writers – and secondly it will allow people who have never experienced any kind of author event, to do so (not everyone can, or does, make the pilgrimage to Keswick or Hexham or Durham or Edinburgh or wherever). Thirdly it allows local writers and independent presses in our area to have a voice and a stage, and to develop their audiences, as well as offering individuals opportunities to participate in creative writing activity. Whilst celebrating local writers and their work, and developing audiences for it, as well as offering individuals the chance to join in with writing opportunities, we must not dismiss the notion of events with the bigger names – the “celebrity” authors as they may be called. There are many people for whom hearing a best-selling author speak at an event, is enjoyable, informative, educational, inspiring and many other thing besides – just as in the same way, there are many people for whom it is not. There are also many people who will love the activity which Mike is outlining above, whilst there will be numbers of people who will not. We need to accept that not everything appeals to everyone, and we should be aiming to cater for this. We need to have a festival which has something to offer for as many people as possible – and on a level playing field, as Mike states. If we could work in a spirit of cooperation we could achieve this two strand approach to a festival, and arrive at an event which pleases lots of different people, AND is an event for Carlisle to be proud of. We just need to avoid those equally treacherous and dangerous traps – literary snobbery and literary inverted snobbery. We need to create the spirit of equality about the choices made by audiences, in terms of writers and events. We must ensure, somehow, that everyone respects everyone else’s literary choices and try to achieve an atmosphere which is non-judgemental about anyone’s tastes and preferences, as they each have equal validity. Everyone needs to be accepting of the fact that everyone’s tastes are different. I would condemn anyone viewing or decrying negatively a preference for a “celebrity” author event instead of for a local writer event, just as I would, equally, for the reverse scenario. Our watchword must be cultural equality for all – both writers and audience – and we should just all celebrate with a vengeance the fact that people will be engaging in an event with a writer – local or best-selling. I agree with everything Helen Towers has said. Helen for PM! Could the festival find room for “creative non fiction” and journals/magazines? Could the festival include a workshop on getting long and short fiction published? I was also at the initial meeting , as Edna Croft had asked both Helen Towers and myself about the possibility of starting a literary festival in Carlisle. We then invited possible interested parties to the meeting in the Crown and Mitre to which Mike and Darren came. Edna, Helen and I researched the various aspects of a literary festival prior to the meeting in the Crown and Mitre. I think the kind of festival Mike wants can be easily run alongside the traditional festival, so that there is equality for all. Many will certainly want Mike’s ideas to be put into practice, but I ‘m sure there are others who would also relish the idea of going to events by well-known authors, meet the person they’ve admired for years, say thankyou to someone whose books have given them inspiration. We need the kind of festival which will suit everyone, without marginalising anyone. We can cooperate to get this diverse festival. We do need to respect the differing literary views potential festival- goers have. I think that there is an equally valid place for celebrity and local author events. Bookends has had a good mix of local and celebrity events in Carlisle in the past , so why can’t a literary festival in Carlisle strive for this mix as well? Hi Sue. It would in effect be open to anyone interested in writing. Those who are not part of a group could become part of one for the event. They would make new friends and meet fellow scribblers thereby building the local writing community. I very much like your suggestion of a giant collaborative event where any passer by can contribute a piece of their own creativity. It will be an inclusive event, and one that would enhance the proposed literary festival. Great ideas. Keep ’em coming. Darren. Crikey ! Can’t see why we can’t have both. I did say I wanted Jane Austin as one of the speakers but few got the joke !